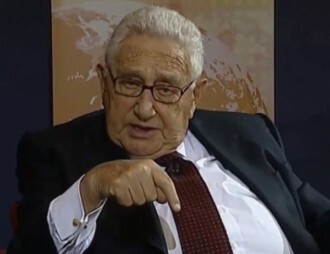 Globalists Push EU-style “Union” for Middle East By Alex Newman, The New American, July 31, 2014 – As if globalist scheming had not yet caused enough death and destruction in the Middle East, the global government-promoting Council on Foreign Relations and various outfits associated with the secretive Bilderberg group are now pushing a radical new plot for the region: a European Union-style regional regime to rule over the Arab, Turkish, Kurdish, and other peoples who live there. The sought-after “Middle Eastern Union” would put populations ranging from Turkey and Jordan to Libya and Egypt under a single authority…. Already, the peoples of Europe, Africa, South America, Asia, and other regions have had self-styled regional “authorities” imposed on them against their will. In the Middle East, numerous similar efforts such as the Gulf Cooperation Council and the Arab League have been making progress, too. Council on Foreign Relations (CFR), June 19, 2014 – Not long ago, Europe was a continent that resembled how the Middle East looks today…. Yet there is reason to hope Europe’s past and present can inform the Middle East’s future. Just as a warring continent found peace through unity by creating what became the EU, Arabs, Turks, Kurds and other groups in the region could find relative peace in ever closer union. After all, most of its problems – terrorism, poverty, unemployment, sectarianism, refugee crises, water shortages – require regional answers. No country can solve its problems on its own. This is the standard line that the CFR globalists are using to build every emerging regional bloc on earth, and it will increasingly be heard in “North America” as well. Washington Post, August 16, 2013 – Although Arab nations have no interest in joining the European Union or NATO, the Arab world can draw on the model of Eastern European transition, with fledgling Arab democracies devising their own supra-national organization dedicated to advancing democracy. Like the E.U. in its infancy, this Union of Arab Democracies (UAD) could start with limited objectives and evolve toward ambitious goals, including, ultimately, pan-Arab political union. “Will Islam organize itself — or as Islam organizes itself either into larger states or one unit,… will it do so from the point of view representing a universal theology that others have to follow…. Or will they adopt a more secular approach in which Islam becomes the religion of its population but not an obligation of other countries to deal with them [such as done by Saudi Arabia and GCC nations]?…. Arab army chiefs plan for joint Arab force – The National (Abu Dhabi, UAE. ), May 25, 2015 – Army chiefs of staff of Arab countries have drafted a protocol for a new joint force to intervene in Middle East hotspots on missions ranging from fighting militants to Iran-backed groups …. However, there was dissension over the force being headquartered in Cairo, the home of the Arab League. Arab League close to forming unified military force – Al Arabiya (Dubai, UAE), May 10, 2015 – Egyptian Foreign Minister Sameh Shukri said the Arab League is moving closer to forming a joint Arab military force, pan-Arab newspaper Asharq al-Awsat reported Saturday. New Arab Order To Defend Middle East – Eurasia Review, April 7, 2015 – Only a strong Arab order can check Iran’s territorial and political ambitions…. The driving force will have to be economic cooperation that confronts the issues of unemployment and poverty; two main reasons for the growth of extremism in the region. It’s a tall order but leaders should act now in order to create momentum for a new regional bloc that will be able to defend the security and stability of the region. The All-Arab Army? – Foreign Affairs (Council on Foreign Relations), April 7, 2015 – More recently, similar plans resurfaced in calls from EU Commission President Jean-Claude Juncker to set up “a joint EU army.” …. The reason: a common European military would have to be the result of a common European foreign policy, not its initiator. Imagine how much greater the challenges will be for the Arab League. Arab League to forge NATO-like military alliance of Sunni powers – Washington Times, March 29, 2015 – Seeking to combat threats from Iran and the Shiite rebels it is supporting in the Middle East, Arab leaders meeting in the resort city of Sharm el-Sheikh, Egypt, agreed in principle Sunday to forge a NATO-like alliance of Sunni powers to engage in regional military action with or without leadership from the U.S.
Arab League Formally Announces Military Force To Counter Islamic Extremism, Foreign Influence – International Business Times, March 30, 2015 – At the two-day Arab League summit, leaders from 22 Arab nations spoke of the need to tackle “outside parties” and “foreign” powers, making thinly veiled references to Iran, which has been exerting its influence in Iraq, Syria, Lebanon and Yemen. Can the EU be a role model for the Islamic world? – Morocco World News, Jan 14, 2015 – The visa requirement must be abolished, and steps must be taken toward establishing a model based on the EU. It will not be hard to initiate a brand new and dynamic integration with new rules and regulations…. Such a rapprochement will make the political and economic structures of Arab societies more predictable and establish a more reliable climate for foreign investors. A union that includes such a broad spectrum can even become a trade giant that puts the EU in the shade. Arab Spring: An Opportunity To Reform The Arab League – Eurasia Review, October 28, 2012 – The Arab League is likely to improve little on its record of collective action until members agree to sacrifice some sovereignty (i.e., installing an enforcement mechanism). How to form an Arab single currency? Gulf News (Dubai, UAE), October 3, 2012 – Lately, the Arab League…decided to study the possibility of setting up an Arab single currency, based on a proposal submitted by the Arab Importers and Exporters Union. Arab League Gets New Sense of Purpose With Syria Pressure: View – Bloomberg, Jan. 23, 2012 – One effect of the Arab Awakening has been to spotlight the lack of regional cooperation in the Middle East. As the tyrants fall, the remaining states would be well served to focus on building the diplomatic architecture that has enabled other regions — Asia, for example, through ASEAN, APEC and other entities — to address not just security issues but also economic revitalization….Certainly the growing threat posed by Iran demands a strong collective response. Perhaps, after 67 forgetful years of existence, the Arab League can grow into that unifying role. Arab League welcomes Bahrain’s rights court proposal – Gulf News (Dubai, UAE), September 6, 2012 – The Arab League secretary-general has endorsed a Bahrain proposal to set up an Arab human rights court. Arab League goes from bluster to clout in Arab Spring – Channel News Asia, March 26, 2012 – Secretary General Nabil al-Arabi tasked former Algerian foreign minister and UN envoy Lakhdar Brahimi to design a plan to restructure the League “to put forward a vision that gives the League foundations to deal with these new developments,” said Ben Hilli. One proposal is a new, robust League security council, he said. The future lies in Arab unity – Saudi Gazette, March 24, 2012 – The covenant of the Arab League should be reformulated so that the group effectively serves the mutual interests of Arabs in line with the local, regional and international developments which have taken place since it was formed in 1945….It would be better if there were a strong all-Arab union to protect the interests of Arabs. When we talk about a union of Gulf nations and Arab unity to face our common enemy, the Zionists, we should remind ourselves of the most effective method for achieving this noble goal: union. The Arab League awakening – The Globe and Mail (Canada), Nov. 15, 2011 – The other fascinating new development is the rebirth and reassertion of Arab sovereignty and influence within the Arab world, after decades during which the incompetent and politically derelict Arab states largely surrendered their regional security and ideological functions to foreign powers, especially Israel, Turkey, Iran and the United States. Arab ministers attend economic, social council session in Cairo – Kuwait News Agency, Feb. 9, 2012 – Arab ministers within the economic and social council met at the Arab League headquarters in Cairo on Thursday….Also attending the meeting was Arab League Secretary General Nabil Al-Arabi….The Arab League chief highlighted the importance of economic regional blocs at this day and age, calling on the member countries to sign up to the Arab Free Trade Agreement. A League of their Own – Majalla Magazine, Jan. 18, 2012 – Even the current secretary-general, Nabil al-Araby, has described the [Arab League] as “impotent”, perhaps in light of the fact that there is nothing in the League’s charter which forces members to comply with its pronouncements. In spite of all of this, over the past year things appear to have changed. Many commentators have noted how the Arab Spring marked a watershed for the League. Beginning with Libya in the spring of last year, when members gave the nod to a Nato bombing campaign, the organisation has developed an increasingly confident strut. A hopeful path for the Arab League? – The Daily Star (Lebanon), Jan. 9, 2012 – The critical link for why the Arab League’s approach to resolving the Syrian situation may be significant is its already expressed intention to refer the Syrian situation to the United Nations Security Council and other international organs…In other words, the Arab League seems to be repositioning itself as a link between indigenous Arab efforts to ensure peace and security and the available global mechanisms to do this. Arab uprisings redefine geopolitics in Middle East – AFP, Dec. 16, 2011 – The Arab uprisings mark a historic milestone in a region long ruled by dictators and have reshaped the political map, heralding the rise of a Sunni Islamist bloc against a waning Shiite axis led by Iran, analysts say. From Tunisia to Egypt, Syria and Yemen, a new order is emerging in the Arab world with the traditional balance of power fading as a new — mainly Sunni — political front emerges. Latin America’s message to the Arab world – Aljazeera, Dec. 9, 2011 – Unasur is also still in the beginning; for the moment it is essentially a forum….So it’s up to Latin Americans to perfect their democracies, advance their own regional integration and….share their experience with their Middle Eastern brothers and sisters in the global South. Arab Spring becoming an Islamic Revolution – Vancouver Sun, Dec. 31, 2011 – Yet there are some signs that in countries lightly touched by the Arab Spring, such as Jordan, and among regional organizations, such as the previously moribund Arab League and the Gulf Cooperation Council, the cries for reform coming from the streets have been heard. Russia’s ‘democracy package’ for Syria – Asia Times, Jan. 6, 2012 – Washington, apparently, and much of the European Union, have given the Russians carte blanche to come up with a solution for Syria, in coordination with the Arab League. ‘Change is unstoppable for Syria’ – Hürriyet Daily News (Turkey) June 8, 2012 – Syrian President Bashar al-Assad must understand that change is unstoppable and act accordingly, former Secretary-General of the Arab League told daily Hürriyet…. “I hope all Arab leaders understand this; change is unstoppable. I hope also al-Assad [understands this]. Not only understands, but acts in that direction,” Moussa said….Moussa was in Istanbul to attend the World Economic Forum (WEF). Arabs put credibility on line with Syria mission– Associated Press, Dec. 27, 2011 – The continued deaths and the sense that Assad is trying to make end runs around the observers threaten to undermine the credibility of the Arab League at a time when it is trying to be more muscular in dealing with conflicts. Syrian opposition calls for UN role to end crisis – CBS News, Dec. 25, 2011 – The Arab League has begun sending observers into Syria to monitor its compliance with a plan demanding an end to the regime’s crackdown on political opponents. The 22-member bloc has warned that it could turn to the U.N. Security Council to help stop the violence that began in March. Arab League may turn to UN Security Council over Syria violence – Christian Science Monitor, Dec. 18, 2011 – The Arab League has threatened to turn to the UN Security Council to pressure Syria to accept its peace plan. The league has set a Wednesday deadline for Syria to act. Syria Says Sanctions Are ‘Economic War’ as UN Reports Abuses – Bloomberg, Nov. 29, 2011 – The Arab League measures, which follow U.S. and European sanctions, will also halt dealings with the Syrian central bank, Qatari Prime Minister Sheikh Hamad Bin Jasim Bin Jaber Al Thani told reporters Nov. 27 in Cairo. The Arab League banned financial transactions and trade with the Syrian government, excluding basic commodities, he said. 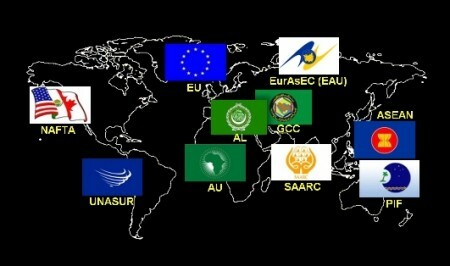 Arab League prepares for Syria sanctions – Reuters, Nov. 25. 2011 – Arab officials will prepare plans for sanctions against Syria on Saturday over its failure to let Arab League monitors oversee an initiative aimed at ending a violent crackdown on protests against President Bashar al-Assad. Official: Syria agrees ‘in principle’ to observers – Atlanta Journal-Constitution, Nov. 18, 2011 – Syria has agreed “in principle” to allow an Arab League observer mission into the country, but Damascus was still studying the details, a senior Syrian official said Friday. Arab League meeting to enforce Syria suspension – CBS News, Nov. 16, 2011 – The suspension decision has enraged Syria, which considers itself a bastion of Arab nationalism. Arab League Agrees On Gaza Aid, Economic Integration – RTT News | Global Financial Newswires, Jan. 21, 2009 – Winding up the economic summit, leaders of the 22-member Arab League (AL) approved a declaration calling for accelerated steps towards the economic integration in the Arab world: to launch a customs union next year, to speed up the construction of a pan-Arab power grid and to start a railroad network project. Khaleej Times (UAE), September 27, 2012 – The head of the Arab League called on Wednesday for the international community to criminalise blasphemy, warning that insults to religion pose a serious threat to global peace and security.